The impedance adapter converts the speaker out signals from the radio to line-in levels for the equalizer. The equalizer give tone control so you can get the optimum usable energy out of the speakers at road noise levels. It also splits two channels into six (two for a sub-woofer if you have another amp and sub-woofer speaker). We use four channels, one for each speaker and the equalizer has a built in signal fader to control the balance between front and rear speakers on the bike. There are levels controls every step along the way so you can get things just right. Then control the rest (overall volume and tone) from the Honda radio. All of it is running on the aux relay and it is all tucked under and behind the equalizer. the slope of the front of the backrest allows for space for the speaker wire hookups. 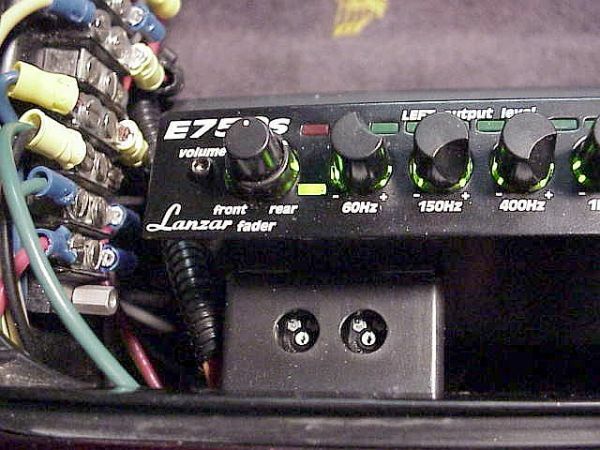 The equalizer is just hanging on the edge of the amp making a sandwich with the compartment divider. A piece of garden hose holds the amp forward and acts as a shock absorber. That's the series.... ask if you have any questions and I have and can take more pix if you need them. Last edited by AZgl1800; 12-29-2015 at 10:33 AM. I'm lost - I have the speakers where they belong and that part of the harness run thru the holes into the under seat area but now am having trouble finding what to unplug and plug into the fader knob part of the harness....Help! Great Info Rudy!. just wondering, next to the CB, you didn't used the front speaker connector, you used the rear speakers output to feed your audio system right?, it gives you the output for the 4 channels? I used my own wiring for the speakers so I could beef them up. The only reason I used the rear speaker harness plug was to get the amp's 2 channel speaker outputs to the rear of the bike without adding more wiring. In the rear speaker pods, I disconnected the stock speaker harness from the speakers and plugged into them so I could get the radio amp output and send it over to the speaker-to-line converters in the trunk. Remember the speakers were all rewired with my own heavier wire, including the rears. The 2-4 channel conversion happens in the equalizer. It takes two channels in and provides 6 channels out. 2 for front speakers, two for rear speakers and 2 for sub-woofers (if used). So the equalizer provides the balance and fade without having to cook a cheapie wire wound fader pot. I didn't use the stock harness front speaker wires at all so that is why they were left open. I know this topic is a little old, but is it possible to directly connect the speaker wire from the unit into an amplifier and go from the amp to the speakers? This would leave the existing fader in place. will this be a problem? Yes, that will be a problem. The extra high wattage from the new amplifier will toast the existing fader. That is why Rudy used the equalizer to do the fading between front and back. The existing fader must be removed. It just wastes speaker power, and that is what you are trying to improve. More power to the speakers. Why dump over half of the power in a fader? I am post fader going to the amp. There is no power added to the fader as its an input line. The amp is only there to boost the power to the speakers. I did not connect the amp at the back of radio, I got my input right at the speakers. I cut the speaker wire right at the speaker and ran the original line going to the speaker to the amp as an input line. The then took a new line from the amp to the speaker (output). I did not have to remove the radio or the fader control to do this. In fact this made adding the amp a 30 minute job. I added the amp last week without any problems what so ever. I still need to bring the front speakers to the amp and get new front speakers. That avoids over powering the fader then. There is a 40 amp relay at the back and under the front left fairing pocket which are driven directly by the aux power 5 amp fuse in the fuse block. This give me 30 amps front and 30 amps rear seperately switched from the aux panel. No other loads are ever put directly on the aux terminals, just the two relay coils. Just did this mod on a 92 aspencade. Took out the fader and followed Rudy's directions on modifying the harness to run the radio output to the rear speaker housing. I am not adding an equalizer just using high level input into the amp then running new speaker wire to all four speakers. Easy mod due to the great write up and pictures from Rudy.